Even if your child doesn’t have food allergies, it’s likely that they will have a friend who does and that means party catering that allows all the guests to have a good time. Babies and toddlers are most likely to have been diagnosed with allergies to milk, eggs, soya and peanuts while school age kids are most often allergic to wheat, peanuts and fish including shellfish. 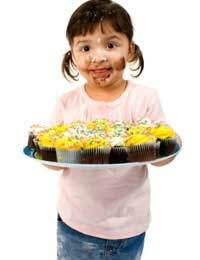 Some children also have food additive allergies. It often happens that children with special dietary needs get served last at parties, which marks them out as different – if you can work out a way to ensure that they are served at the same time as others, they will feel much happier as being treated in this way is a bit like being the last child chosen for team games! The family of a child with food allergies may have excellent recipes and tips for catering a party – ask them if there are favourite foods that could be prepared for the whole party as well as being safe for the allergic child. As cross-contamination can be an issue, designate every child a seat at the table and make sure they stay in them, this means that a child with food allergies is less likely to pick up traces of the allergen from crockery or cutlery. And when little ones head for the toilet, make sure they return to their own seat, not somebody else’s, as they may have no idea which is their seat! A child with an allergy must not trade food with other children, which can be difficult when we spend most of our time teaching our children to share – make sure that one adult in the room keeps an eye on that child and wards off any well-meaning attempts to swap food with other kiddies. This recipe is egg, wheat and dairy free but also delicious. It makes around 14 cakes. Heat the oven to 180 C or Gas Mark 4. Put the egg replacement powder in small bowl with the three tablespoons of milk and mix well. Mix the dairy free spread, sugar and golden syrup together in a large saucepan over a very low heat, stirring gently until they are well blended and melted together. Remove it from the heat. In a large bowl, sieve together the flours, bicarbonate of soda, baking powder, Xanthan gum and cocoa powder, then tip the mixture into the saucepan and mix until smooth – at this point the mixture will be very stiff. Now pour two thirds of the rest of the milk into the pan and stir until smooth, adding most or all of the rest to make a wet batter. Pour the batter into cupcake cases to about half full. Bake for fifteen to twenty minutes. Check they are cooked by inserting a skewer into the centre – if it comes out clean the cakes are baked. Top with melted dairy free chocolate. Ice cream is such a classic party food that it’s almost impossible to imagine a children’s party without it, but it can be impossible for lactose intolerant, wheat allergic and diabetic children to enjoy. Instead, try this easy to make sorbet which is suitable even for diabetics. Blend a little icing sugar and citrus juice into a small amount of the apple juice to make a rich syrup – then use this syrup to adjust the taste of rest of the apple juice – when it’s frozen it will be less sweet than unfrozen. Churn the liquid in an ice-cream maker if you have one. If not, pour into shallow contains, so that it’s an inch deep, and freeze. When just frozen, use a fork to break up the ice into a soft sorbet and either serve immediately or transfer to larger tubs and refreeze. Don’t pack too tightly or it will lose its sorbet consistency.